I’m a big fan of podcasts. There’s so many great ones out there! One of my favorites is the Social Media Marketing podcast. Host Michael Stelzner brings on impressive thought leaders from across the digital marketing stratosphere, sharing great tips and strategies along the way. Apologies for the long quote, but I think it’s critically important for authors to read, and re-read, what Godin just said. Here is a man who has made a successful career from writing, and he is telling others that the publishing industry is broken, and you cannot rely on just being an author. Regardless of the type of book, I think Godin’s thoughts still apply. Please don’t let this deter you from sharing your ideas though. That isn’t why I am writing this whatsoever. You have important ideas, thoughts, experiences, and strategies to share with the world. Share them! But realize that a book is not the end-all-be-all. To paraphrase Jeffrey Hayzlett, when you’ve published a book, the hard work is just beginning. I’ve heard many authors share with me that they write books not to make a living from, but to establish their thought leadership, book more speeches, etc. When the average business book sells 7,500 copies – think of your book as a tool to grow your audience. We’re in a time now where the value of someone also includes their overall audience size. So ask yourself: What’s the value of your audience? First and foremost, your fans and followers on social media and on your distribution lists will be your largest cheerleaders (after your family, of course). Growing these two numbers will help determine your success. Where else would you be without your audience? So how are you going to grow your numbers? Do you have a plan in place? Have you considered all avenues? When you’re preparing to announce your book, reach out to your friends and family to request they help socially activate your great news. It’s as easy as sending out a brief email, sharing the news, along with two to three sample posts they can use across Twitter, Facebook and LinkedIn. End your email thanking them, and asking how you can help them. Next, what kind of information is your audience after? You’ve got a book – use it! Videos, blog posts, worksheets, and downloadable chapters all make great content opportunities that your audience can enjoy (and subscribe to!). Take each chapter and develop at least one video and one blog post. You’ve got 12 chapters? That’s 24 pieces of content you have to activate, share with your networks, and 24 opportunities to reach potential new clients, speaking opportunities, and readers who want to buy your book. This automatically plays into your content marketing. Drip each of these pieces out to your audience, following it up with an email to your distribution list – again, with requests to share with their audience. See the circle? By continuing this circle – creating content, sharing it with your audience, emailing your database with content, requesting activation support, creating more content… – you will soon start to see your audience grow by leaps and bounds. 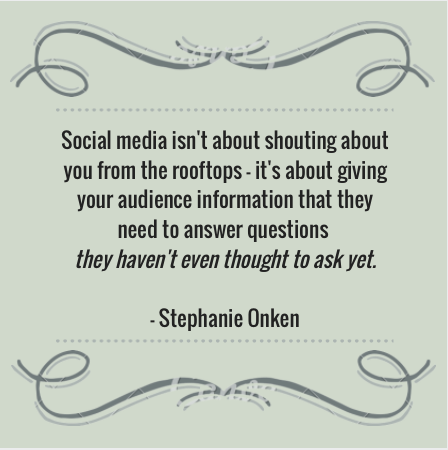 Remember, social media isn’t about shouting about you from the rooftops – it’s about giving your audience information that they need to answer questions they haven’t even thought to ask yet. How else can you get creative with your new book? Sound off below!